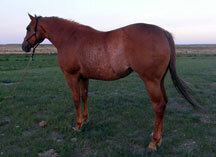 “Duncan” is a pretty, 15.2 HH sorrel mare with roan flecks throughout. We bought her as a 3 year old started on barrels from Rayel Robinson. She was a tremendous athlete, very light footed and catty with tons of turn and grit. Sired 796 foals, 649 race starters, 369 race winners of 1290 races,32 stakes winners,50 places,$2,913,244,361 ROM Race, 50 shown earned AQHA H-219/P-928, 17 ROM,1 Superior Halter, 4 Superior Performance, 1 AQHA World Res.Champion,NCHA $137. 25% FQH (In otherwords…Some of “The Good Old stuff” that’s hard to find.